The first time I ever heard the Bergara name was at a friend’s house examining his new custom bolt gun that he said had a very accurate but rare barrel from a company in Spain. 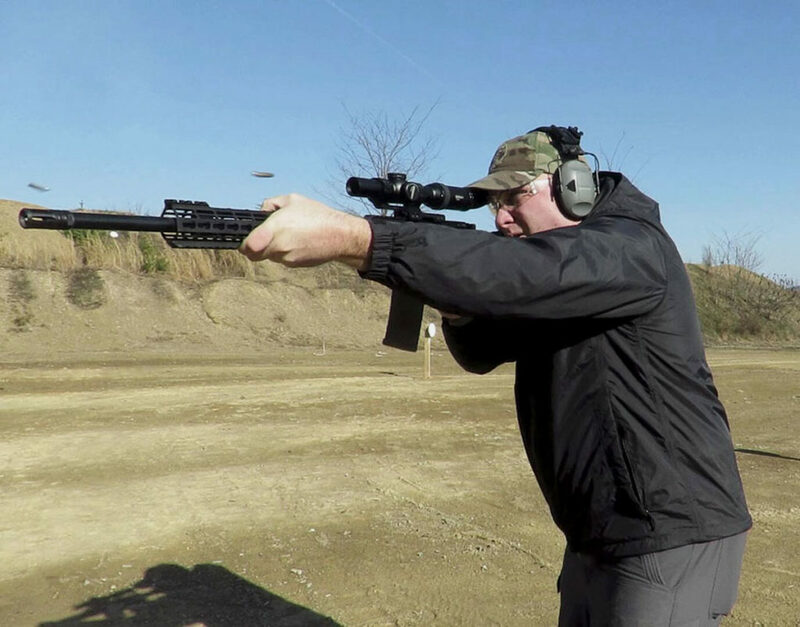 I wasn’t reacquainted with the Bergara brand until a long time after that when I was given the opportunity to review Bergara’s Premier LRP and HMR rifles. Experiencing the customer service, quality, and accuracy for myself, I understood why my friend liked his barrel so much. In fact, I ended up keeping the HMR for my own collection. At that point, I knew that Bergara had been providing OEM barrels to manufacturers but I honestly didn’t know that they made aftermarket AR barrels until recently. I got in touch with Bergara regarding this and they graciously sent me a 20” .223 barrel to test out. Now, some will probably consider the 20” barrel antiquated, much like the musket, but there are some benefits to having a longer barrel. Sure, it’s heavier, but the extra barrel length provides some added muzzle velocity that can be useful while the rifle length gas system creates a smooth shooting rifle. Good specs, great fit, and finish, this barrel has a lot going for it. The barrel that I was sent is made from 4140 Chromoly steel with a medium/heavy contour and a black nitride treatment. I can already hear the internet forums bemoaning the use of 4140 CM steel in an AR-15 and granted it’s not per the mil-spec but in my opinion that’s ok. The actual material properties between 4140 and 4150 have been debated ad nauseum and unless you subject your AR-15 to regular full auto sessions in the worse conditions imaginable than a 4140 Chromoly barrel will work for 9/10 shooters. In addition, the black nitride surface treatment provides added surface hardness to resist wear and corrosion similar to mil-spec chrome lining but without the negative impacts on accuracy. 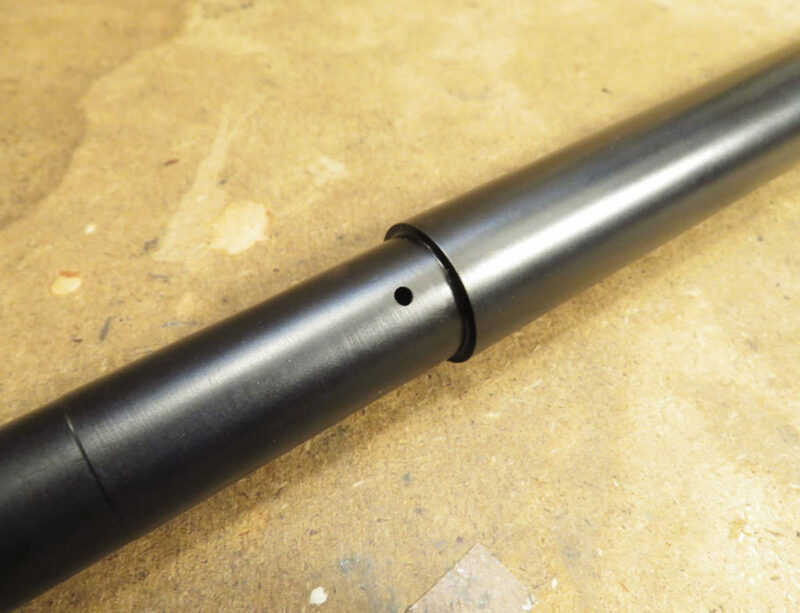 The black nitride treatment also gives the barrel a deep black appearance that is smooth as silk with no anomalies or imperfections that I could detect. 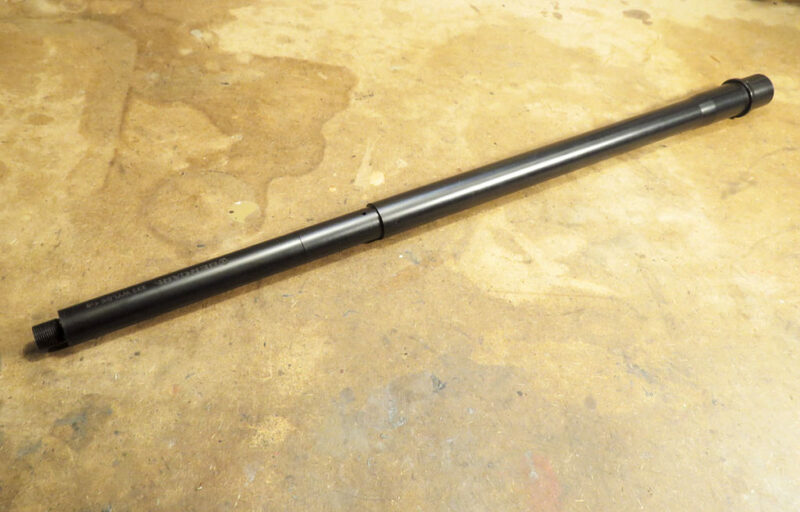 As good as the barrel looks, what about some of the more tangible qualities that make a good rifle barrel? First, every barrel goes through an extensive process to ensure that a quality product comes out the other side. The cylindrical bar of steel that eventually becomes the barrel is straightened to a tolerance of .004”, which is a process many manufacturers don’t do. After a perfect hole is drilled through the steel, it is polished with special honing spindles that use diamond tipped bits. 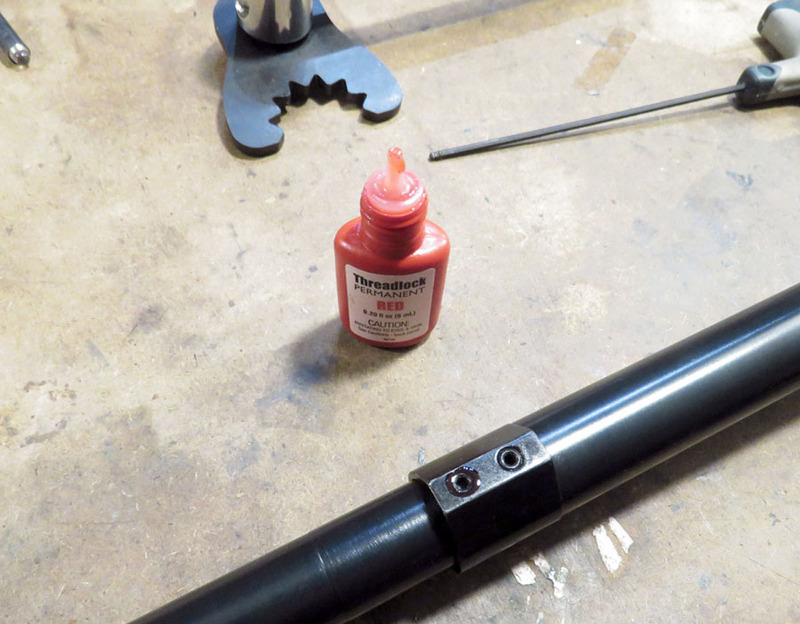 This step is expensive but it gets rid of any machining marks in the bore, leaving a mirror-like finish for good accuracy and easy cleaning down the road. A carbide rifling button is pulled through the bore to form the rifling and twist rate with an acceptable groove diameter tolerance of less than .0002”. After this, the barrel is stress relieved and moves on to additional steps to have the gas port drilled, barrel extension installed, and receive the black nitride treatment. 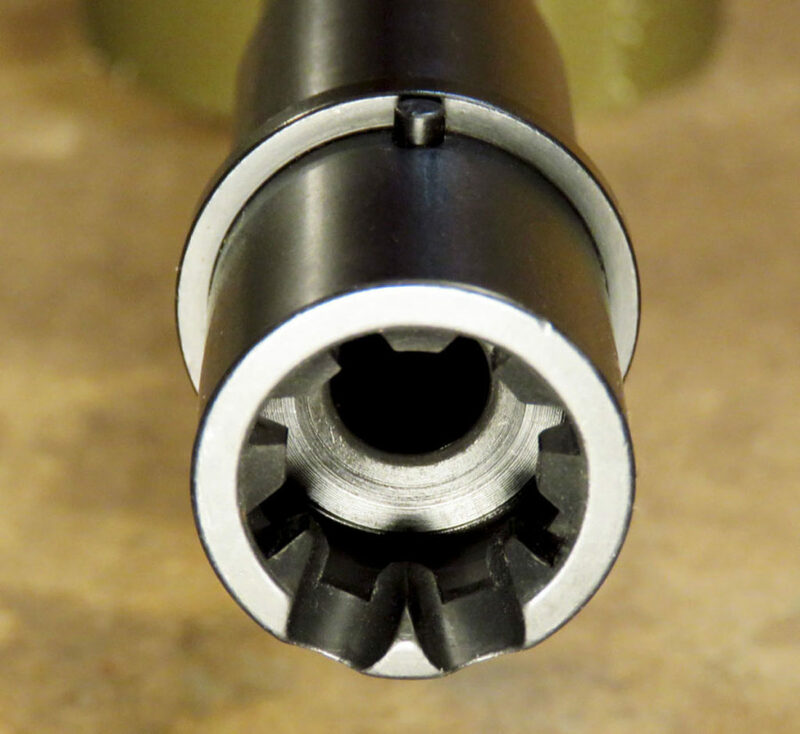 The barrel extension is clean and polished with M4 cuts for reliable feeding. The ding visible at 1 o’clock is my fault, a result of careless handling. The gas journal is .750″ so it is compatible with most any low profile or adjustable gas block. 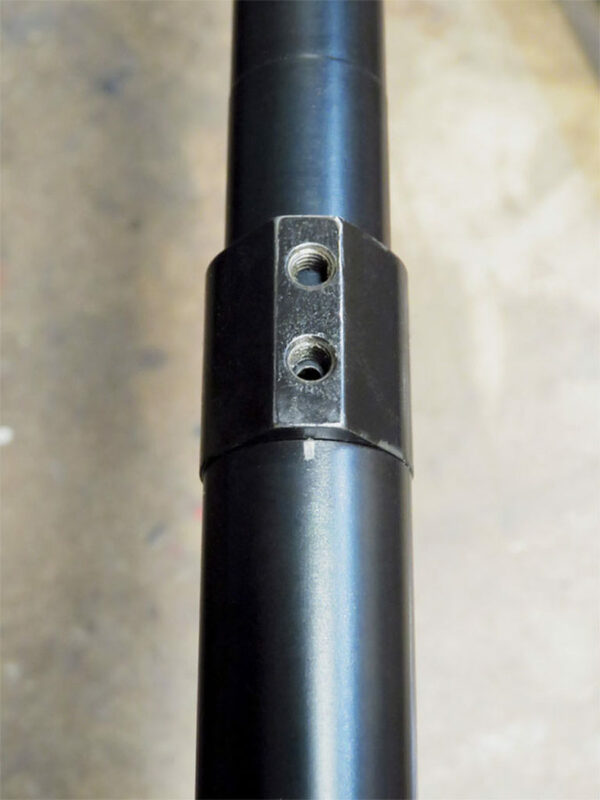 Gas port sizing is vital for the reliable function of an AR-15 and I was pleased to find that the gas port on this barrel was up to spec for a 20″ barrel with a rifle length gas system, measuring about .094″ ± .001”. The muzzle is threaded 1/2-28 for all of your common brakes or flash hiders and has a very nicely done 11-degree target crown. 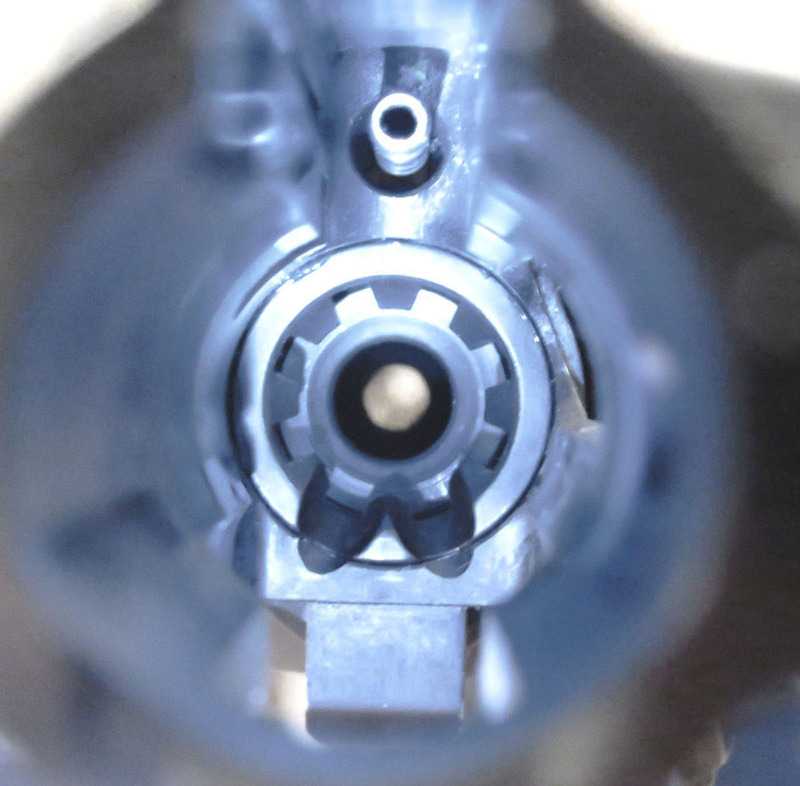 The barrel is chambered in .223 Wylde, a common go-to for many barrel manufacturers since it can safely shoot 5.56 NATO and .223 Remington pressure ammo, with great accuracy potential. The 1:8 twist can also stabilize a wide variety of bullets from lighter 55 gr ammo all the way up to the heavier 77 gr match variety. Everything about this barrel is very clean and well done, from the barrel extension to the crown, its quality certainly belies its $95 cost. 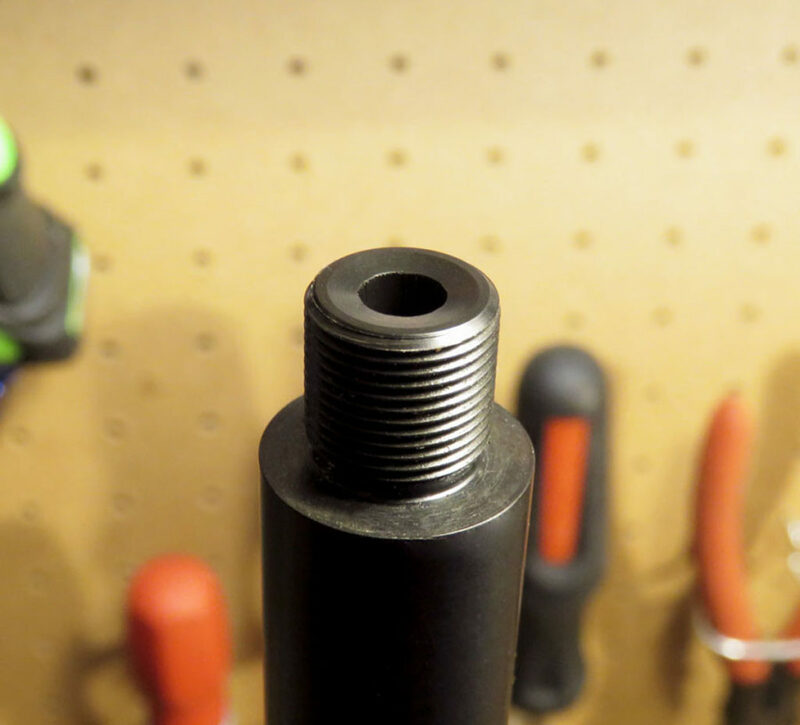 Something that I didn’t mention in my overview of the barrel was the lack of any dimpling opposite the gas port for a low-profile set screw gas block. I think many of us get so used to seeing barrels set up from the factory with at least one dimple that when it’s deleted fingers start to get pointed and names get called. That being said, there are some good reasons to not dimple a nitride barrel since dimpling it can compromise the surface treatment and add to production costs. Additionally, a dimple isn’t absolutely necessary for a set screw gas block anyway, a dab of red thread locker and about 30 in/lbs of torque should keep everything in place. Just a little dab will do on these set screws. If you use too much thread locker it can actually seep its way around the gas block making removal much harder down the road. Another aspect of the barrel that I wanted to point out is that it’s contoured so that the gas block is supposed to touch the barrel shoulder to properly position it over the gas port. Normally, there would be a tiny gap there to accommodate the handguard cap but it appears Bergara intended for this barrel to be used with free floated handguards from the get-go. Since the barrel is not dimpled, I put a witness mark on the barrel so that I would know when the gas port was aligned with the low profile gas block. I wanted to be as thorough as I could in evaluating this barrel so I built a new upper receiver around this barrel and ran it in a couple of different configurations over the course of my range trips. Perfect alignment of the M4 cuts on the barrel extension and receiver. I felt that this allowed me to explore the potential of this barrel as it was being utilized in a couple of different roles. Please understand though that I didn’t have gobs of ammunition at my disposal but I did procure a pretty good mix of ammunition to use for the testing. The chart below shows the muzzle velocity and accuracy results from my testing. Group size is the average of two 5-shot groups at 100 yards. Muzzle velocity taken with Magnetospeed Sporter. Slinging lead out to 300 yards. I did accuracy testing and some mid-range target practice first using my Nightforce 2.5-10X42 mounted up in a Badger Ordnance Unimount. I know the groups aren’t going to win any records but going into this I never thought of this barrel as a match grade barrel and in some cases, I was hoping for a little better. Hornady Black 75gr BTHP performed the best in this barrel at 100 yards. The two fliers could’ve been easily my fault. That being said, I think a couple types of the factory ammo that I had showed potential and things would likely improve as the barrel breaks in. The combined average group size for 50 rounds across five different types of ammunition was less than 2 MOA. Personally, I’d rather have a barrel that will shoot almost everything under the sun into a consistent 2 MOA group over one that will do ½ MOA but starts to string shots as it heats up. Shooting steel out to 300 yards was just too much fun and the smooth recoil of that rifle length gas system made it easy to stay on target. I loaded a magazine with the last of the Hornady Black and Frontier ammo and went after the small plate at 300 yards. Wouldn’t you know it, a magazine of mixed ammo with different bullet weights and muzzle velocities put 80% of the rounds on that 6″ steel? In that first range trip the barrel was proving itself to be accurate, 100% reliable, and perfectly gassed with an ejection pattern to the 3:00 o’clock or just slightly back. The Vortex 1-6 Strike Eagle paired well with the 20″ barrel. 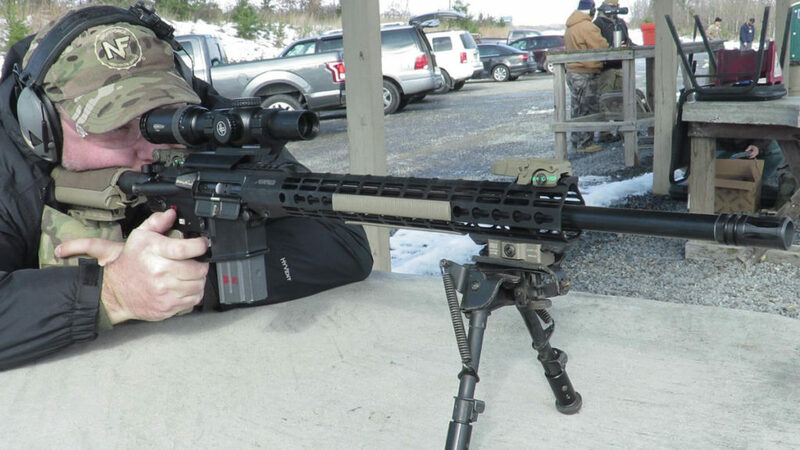 I switched out scopes for a Vortex 1-6 Strike Eagle to configure the rifle for more general-purpose use that you might take with you to the range, competitions, or out in the field. I zeroed the optic at 50 yards to better align with the AR-BDC reticle and at 50 yards, the barrel was putting American Eagle 55gr ball on top of each other. 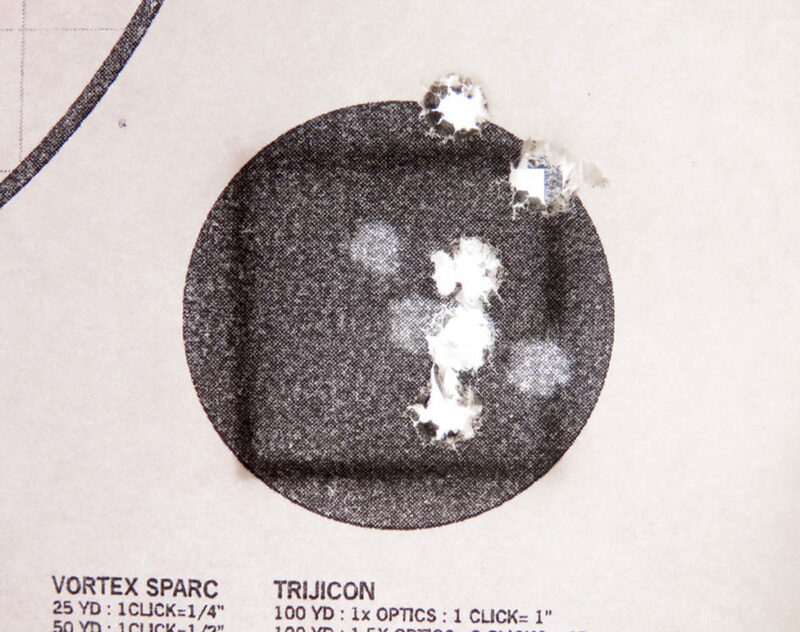 The muzzle velocity of the 55 gr FMJ bullet matched up perfectly with the AR-BDC reticle and going back and forth between the 200 and 300-yard steel was as easy as 1..2..3. I ran the numbers through JBM Ballistics to work out just how close the ammo is to the BDC and at 600 yards the BDC will only be off about ½ MOA or just 3″. 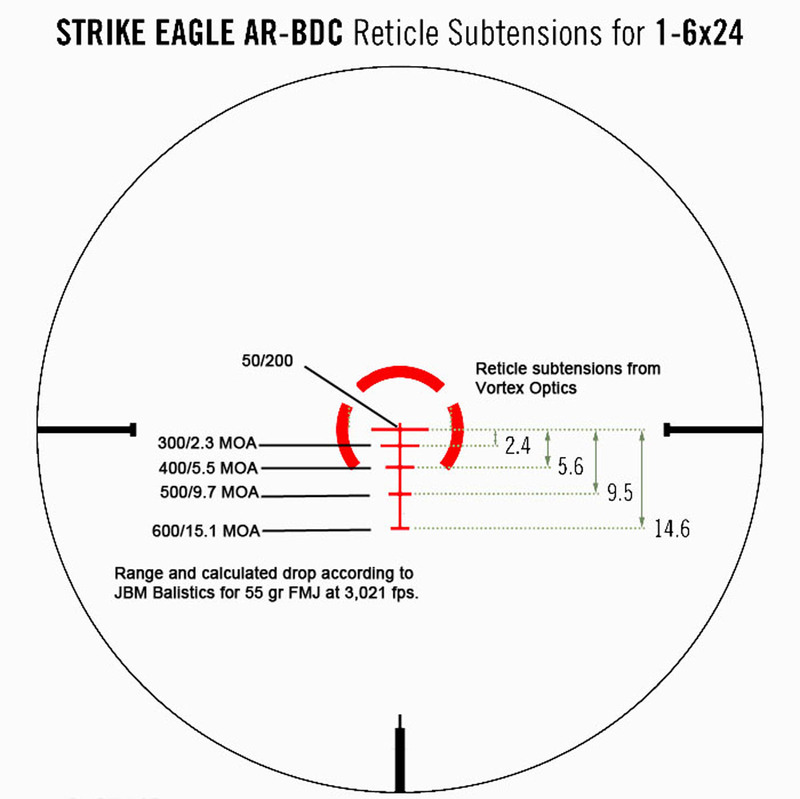 Bullet drop was almost dead on to the AR-BDC reticle. Hammer pairs at 10 yards were no problem for this rifle. The barrel is a bit of a pig and it showed as I was transitioning between targets in the close range bays working on some simple rifle drills. In reality, though, I don’t believe it’s any worse than some carbines that are kitted out with light, sights, suppressor, and front grip. In open-air environments, the barrel length is a non-issue in my opinion, but in more confined spaces or around barricades you will have to execute a higher level of muzzle awareness. That being said, the combination of the heavier barrel profile and rifle length gas system kept the muzzle level with just a standard A2 compensator while slinging brass. After I’d ripped through multiple magazines the barrel was feeling pretty toasty and sometimes a barrel will start to string shots as it heats up, which sparked my curiosity. I went back to the 50-yard line as quickly as I could so that the barrel didn’t have a chance to cool down much and put five rounds on a target I had put up earlier. Ten shot composite group to display zero retention between a cold barrel and a hot barrel. The square is 1″ and the circle is 1.5″. Even with a hot barrel the zero never wavered when overlaid with the previous week’s zero target, 8 out of the 10 rounds could be covered with a nickel. All 10 shots were still being under an inch. Despite its bargain-basement price, this barrel is spitting out performance that in my experience is on part with much more expensive barrels. At no point did I feel let down or disappointed with it for any reason. 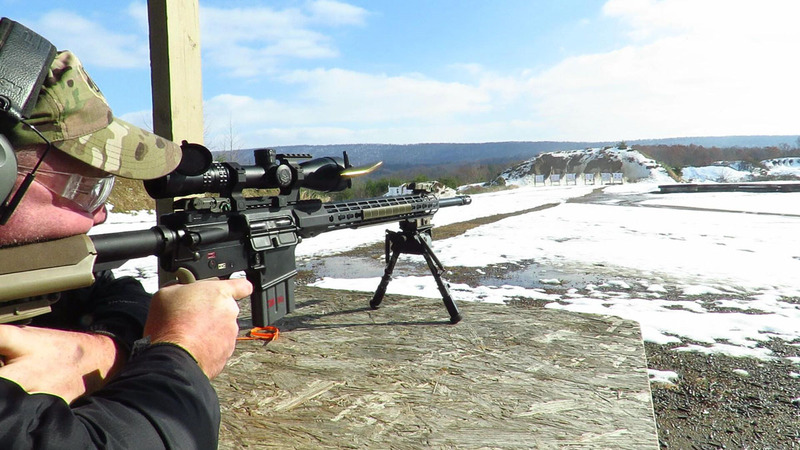 The fit and finish are exceptional, reliability was 100%, and the accuracy was certainly sufficient to reasonably do anything you’d need a rifle to do. 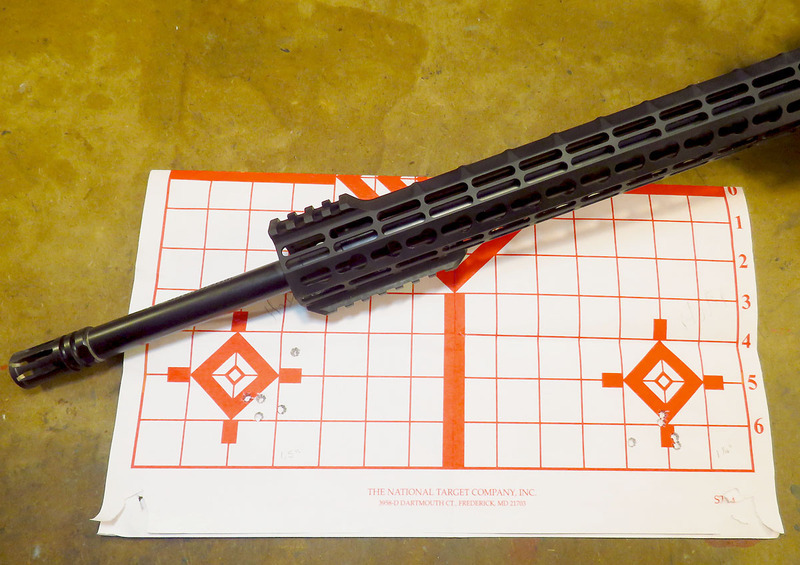 Bergara also makes a 16″ version of this barrel .223 as well as those in .308 and .300 Blackout in common barrel lengths. I highly recommend that if you’re in the market for a good barrel at a great value, you should check out Bergara’s offerings. To see Bergara’s selection of AR barrels go HERE. Does KA-BAR’s Tactical Spork Take ‘Tactical’ Too Far? I talked to Bergara at SHOT Show and asked them about why some barrels ended up on the website and others seemed to disappear. Their explanation to me was that they put what barrels they have in stock up on the website and take down what’s not available. It might be worth giving them a call to see when the 20″ barrels are back in stock. I hope this helps. I went to the link you give in the article, but there are only 16″ barrels. Was yours special order?